This article is about Bowser's fire breath in the Mario franchise. For his Offensive Power Shot in Mario Power Tennis and Mario Tennis: Power Tour, see Fire Breath (Power Shot). Fire Breath is an ability Bowser can use in various games. True to its name, Fire Breath is a stream of fire that is expelled from the user's mouth. Although it is the signature ability of Bowser and, by extension, his skeletal form, other members of his species have been seen breathing fire, most notably Bowser Jr. and Bowser's Brother. Despite being unrelated to the Koopas, Yoshi has also demonstrated the ability to breathe fire. Bowser, along with his impostors, first use Fire Breath in Super Mario Bros. and its sequel, Super Mario Bros.: The Lost Levels. As Mario goes mid-way through castles, they are used to hinder his progression. 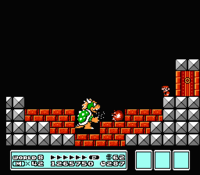 In Super Mario Bros. 3, Bowser's attack pattern involves spitting fireballs, then jumping diagonally and ground pounding. Bowser uses Fire Breath in Super Mario World. When Mario or Luigi throws Mechakoopas at him, he flies out of control and flies aways and spits flames down at Mario or Luigi. He also does this a second time when they throw Mechakoopas at him again. Aside from Bowser, Ludwig and to a lesser extent Iggy and Larry are also depicted as using the Fire Breath attack in their boss fights. While Ludwig's is a typical forward-moving flying projectile, Iggy and Larry form theirs into spheres are roll them. Bowser uses Fire Breath in Super Mario 64 and its remake, Super Mario 64 DS. He spits single balls of fire. Bowser also has a variation of fire-based attacks: shooting fireballs into the air, causing several small fireballs to fall; another involves Bowser spitting a number of fireballs that disappear after a while; and the third involves shooting a continuous stream of fire for a short time. Also in Super Mario 64 DS, Yoshi's Power Flower ability gives him Fire Breath, which allows Yoshi to blow fire for a short time by pressing . In Super Mario Sunshine, Bowser uses Fire Breath. He attacks by breathing massive gusts of flames over the sections of the slime-filled tub Mario is traversing. In New Super Mario Bros., Bowser spits fireballs at Mario or Luigi during their battles. He also spits barrages of blue-colored fireballs. In the first world, Bowser attacks similarly to the way his impostors did in Super Mario Bros. In Super Mario Galaxy, Bowser uses Fire Breath. In Bowser's Star Reactor, when Mario reaches the stairs, Bowser appears and starts spitting fireballs at Mario or Luigi. In the battle, when Bowser stomps on the planet's glass and his tail burns, and when Mario or Luigi spins into him, he will start shooting fireballs at them. In Bowser's Galaxy Reactor, Bowser attacks by shooting fire in rapid succession. Unlike the first battle, he is more aggressive and he shoots them faster. In New Super Mario Bros. Wii, Bowser uses Fire Breath. In the last castle of World 8, Bowser sends out fireballs toward Mario, similarly to his function in Super Mario Bros.. In the battle, Bowser is fought in a similar way as in New Super Mario Bros., attacking by shooting fireballs. When the switch is pressed and he is plummeted into the abyss, Kamek revives him and he grows giant. He attacks by spitting massive fireballs and destroying the structures on contact. In Super Mario Galaxy 2, Bowser uses his fire breath as one of his attacks, spewing a continuous stream of fire across the planet as he chases Mario or Luigi. Bowser uses Fire Breath, along with fake Bowsers in Super Mario 3D Land. Bowser and his fakes shoots fireballs to block Mario's path in crossing the bridge to press the switch. Bowser, in his giant form, chases Mario and shoots massive fireballs at him, which destroys anything blocking Mario's path, and the platforms he is standing on. In New Super Mario Bros. 2, Bowser uses Fire Breath. He attacks by using fire and iron mallets in battle, reminiscent of Super Mario Bros.. He attacks in a similar way as in New Super Mario Bros. and New Super Mario Bros. Wii. After he is defeated, the Koopalings in the Koopa Clown Car use their wands' magic to revive him and he grows giant. In two segments of the battle, he breathes fire at Mario on a full platform. Bowser's Fire Breath (referred to in the Prima Games guide as Bowser's Flames) reappears in New Super Mario Bros. U, though it acts more similarly to the raining molten rocks from previous games than his normal fire. On two stages of Peach Castle, Meteor Moat and Firefall Cliffs, the flames rain down from the sky, destroying any Brick Blocks they come into contact with. Bowser is also seen using the move in The Final Battle. These obstacles also appear in the challenge, Cloudy with a Chance of Fire. Bowser uses Fire Breath in Super Mario 3D World. He spits fireballs that leave residue. He also attacks by throwing explosive soccer balls at Mario, Luigi, Peach, Toad, and Rosalina. In Bowser's second encounter, he spends most of the battle spewing residue-producing fireballs at the characters. Meowser clones also breathe fire. Bowser uses his Fire Breath in his final fight against Mario in Super Mario Odyssey. After Bowser is damaged, he jumps to the center of the room and sweeps a large stream of fire around the arena in an attempt to burn Mario. The attack is rather fast, and can only be dodged by jumping over it. A ring of fire forms around Bowser as he uses the attack, protecting him and preventing Mario from getting too close. In Super Mario Kart, Bowser tosses fireballs on the track that, when characters make contact with it, they will spin out. Fire Breath is one of the special moves used by Bowser and Giga Bowser in the Super Smash Bros. series. Bowser and Giga Bowser use this move whenever the Button is pressed. It is exactly the same as a Fire Flower, except that the flames become smaller the more it is used; in Super Smash Bros. Melee, Bowser begins to exhale smoke that does not deal damage after a while, though in later games this does not happen. Giga Bowser's Fire Breath can be used indefinitely in Super Smash Bros. Melee, although it adopts the weaknesses of Bowser's version as of Super Smash Bros. Brawl, due to him becoming Bowser's Final Smash. In Super Smash Bros. Brawl and Super Smash Bros. for Nintendo 3DS / Wii U, Yoshi can also use Fire Breath, although he can only do so via his own Final Smash, Super Dragon. Petey Piranha can also breathe fireballs during Piranha Plants's Final Smash. Bowser and Giga Bowser's Fire Breath is somewhat of a long-distanced move, and is usually best to use when the enemy is coming in for close-range combat. Starting in Super Smash Bros. Brawl, players can also angle the flames up and down with the control stick. However, the move will leave Bowser and Giga Bowser motionless while using the attack, and will leave their backs open for attack. If Bowser or Giga Bowser fully use up this attack, they will have to wait about 10 seconds for it to be fully recharged again. In comparison, Super Dragon's Fire Breath functions quite differently. Not pressing any buttons will result in Yoshi exhaling a stream of flames, similarly to Bowser. Conversely, pressing the attack button will result in him exhaling a powerful Fireball. One of Ridley's attacks, Plasma Breath, has a similar function to Fire Breath. Super Smash Bros. for Nintendo 3DS / Wii U introduces customizable special moves that only Bowser can utilize, as Giga Bowser can only use the default Fire Breath. Fire Breath, like all others, has two variants. The first one is Fire Shot, which has Bowser exhale a single Fireball that travels forward and pierces enemies; the move can be used consecutively by holding down the special attack button, and does not decrease in power the more it is used. The second is Fire Roar, which is more powerful and has longer range at first, but loses power faster and takes longer to recharge. Bowser using Fire Breath in Super Smash Bros. Brawl via Giga Bowser, his Final Smash. Fire Breath in Super Smash Bros. for Wii U. Fire Breath in Super Smash Bros. for Nintendo 3DS. Fire Shot, one of Fire Breath's custom variants in Super Smash Bros. for Nintendo 3DS. Fire Roar, one of Fire Breath's custom variants in Super Smash Bros. for Nintendo 3DS. Yoshi using Fire Breath in Super Smash Bros. Brawl via Super Dragon, his Final Smash. Yoshi using Fire Breath in Super Smash Bros. for Nintendo 3DS via Super Dragon. Once Bowser's used up his fire once, he needs time to recharge. Give him 10 seconds, and he'll be ready to roast! You can change the angle of Bowser's flame. Try aiming slightly above the enemy to make it harder for them to escape! Bowser's not above dirty tricks. 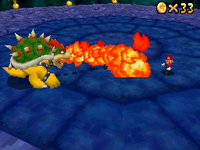 In the Mario Party series, Bowser uses his Fire Breath to hinder the characters' progress in the minigames. He also uses it for any other purposes in the games. In the opening of Paper Mario before Mario falls near Goomba Village, Bowser finishes Mario off with a powerful fire breath attack that does 10 damage. 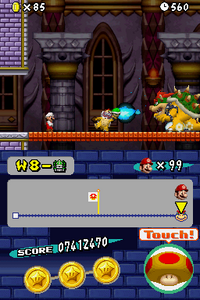 Bowser uses this same technique on the Power Platform at the very end of the game. In Paper Mario: The Thousand-Year Door, Bowser uses Fire Breath in the battles between him and Mario. He can also use it in his side-scrolling levels with . 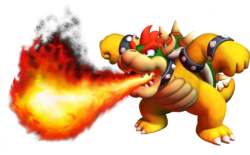 Artwork of Bowser using his fire breath in Super Paper Mario. Bowser uses this move in Super Paper Mario and it is his special move in the game when the player presses the . It can be used to light candles, and it can also attack enemies from a distance, giving Bowser a slight advantage. 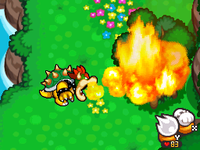 Artwork of Bowser using the fire breath in Paper Mario: Sticker Star. 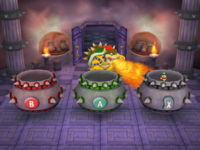 In Paper Mario: Sticker Star, Bowser uses fire in the battle with Mario and uses different variations of the move. One variation of the move can cause a page of Mario's sticker album to be cleared. In Paper Mario: Color Splash, Bowser, Dino Rhinos, and Wild Dino Rhinos use Fire Breath in battle. Draggadon breathes fire at Mario and Huey before they use the Basin Thing to stop him from being hostile. Magma Burgers can also cause several Shy Guys to breathe fire. In Mario Power Tennis and Mario Tennis: Power Tour, the Fire Breath is the Offensive Power Shot used by Bowser. It involves Bowser breathing fire on the ball and sending it over the court alight. A similar move was seen as Bowser's special shot in the Dream Table Tennis event in Mario & Sonic at the Olympic Games. Bowser use his the Fire Breath in Mario Tennis Aces as part of his Special Shot. The movie is called the "Fire Breath Barrage" and consists of Bowser setting his tennis racket ablaze with his fiery breath to hit the ball. In Mario Sports Mix, Bowser uses fire in Dodgeball. In this sport, he spits a fireball on the court, near the goal, and throws the sports object toward the goal. In Mario & Luigi: Superstar Saga and Mario & Luigi: Superstar Saga + Bowser's Minions, Bowser uses the Fire Breath during the tutorial battle as his only attack. As Rookie, he uses it along with throwing hammers at the Mario Bros. Bowletta, a transformation between Cackletta's spirit and Bowser, also uses it when the Mario Bros. encounter her in the throne room of Bowser's Castle to engage the bros in battle. In battle, one of her attacks involves her placing blocks with numbers on them above Mario and Luigi's heads which need to be destroyed by rapidly striking them before she, after a few seconds, tries to burn them both with this attack to avoid taking damage. In Mario & Luigi: Partners in Time, Bowser, along with his baby self, Baby Bowser, breathes fire at Mario and Luigi. In the first battle with Baby Bowser, he only attacks by spitting a fireball at Baby Mario, which can be avoided by jumping. In the second battle against him, along with his adult self, he jumps high and ground pounds Bowser, releasing flames from his mouth. If he is alone, however, he uses his hammer to send the fireballs he spits out at the bros.
Fire Breath is also one of Bowser's commands in Mario & Luigi: Bowser's Inside Story and its 3DS remake, Mario & Luigi: Bowser's Inside Story + Bowser Jr.'s Journey. 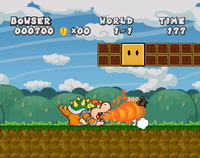 When used in battle, Bowser will inhale and when his face turns red, the player must press and hold or to execute the technique, burning any enemy in his path. The attack can also be used out of battle by pressing to ignite Launch Fits, burn trees and flowers, and more. However, when Bowser first appears in Cavi Cape, he is unable to use this ability due to (as later found out in Plack Beach) a Scutlet clogging his Flame Pipe. Once the Mario Bros. defeat the Scutlet, Bowser's Flame Pipe returns back to normal and he can use his Fire Breath again. The Dark Star uses the Fire Breath when absorbing Bowser's DNA in the Airway late in the game, and Dark Bowser uses this move as well. In Mario & Luigi: Dream Team, Bowser uses Fire Breath and it functions the same as in the previous games in the Mario & Luigi series. Bowser, supercharged by Antasma, he uses his Fire Breath and knocks Mario and Luigi unconscious. In battle, Bowser curls up into a ball, chases Mario and Luigi, and spits fire at them. Dreamy Bowser also uses this move during the final battle. In Mario & Luigi: Paper Jam, Bowser uses his Fire Breath along with his paper counterpart in the final battle. Shiny RoboBowser can also use it during the battle. In Super Princess Peach, Bowser makes use of his Fire Breath ability. Other than attacking Peach by breathing continuous streams of fire, he creates a column of fire, breathes a massive fireball, and breathes multiple, bigger fireballs at her. In Mario Hoops 3-on-3, Bowser uses a variation of the Fire Breath as his Special Shot known as Bomber Dunk. When he performs it, he sets the ball on fire and he leaps into the air and dunks it, with a column of flames appearing afterward. Bowser uses his Fire Breath in Super Mario Strikers. Anyone hit by it will be knocked back and appear to be burned for a short time. In Mario Strikers Charged, Bowser uses a Super Ability! called Fire Storm: when he uses it, he breathes fire that will render the characters on fire, including his teammates. In Mario & Sonic at the Olympic Games, Bowser uses Fire Breath as his special shot in the Dream Table Tennis event. In the Nintendo DS version of Mario & Sonic at the Olympic Winter Games, Bowser uses Flame Dash, a variation of the Fire Breath, as his special skill: it encases him in a fiery aura that allows him to move very fast. In Mario Super Sluggers, Bowser uses a Star Swing move called Breath Swing. He creates a column of fire from the fireballs. In the Mario Golf series, Bowser uses a variation of the move as his skill shot. In the opening clip of Mario Golf: Toadstool Tour, he is seen breathing fire when he got angry from receiving a black eye. In Mario Golf: World Tour, Bowser uses this attack on the camera when he gets an eagle or better. In Mario Sports Superstars, Bowser uses this attack on the camera during golf after getting an Eagle or better, same as Mario Golf: World Tour. Most of his specials involve him breathing fire. ↑ New Super Mario Bros. U Prima eGuide, Peach's Castle tab. This page was last edited on March 30, 2019, at 17:10.